3 easy steps to make more money with winterization promotions. Get ahead of the slow season! Just because there's a chill in the air and the leaves are falling, doesn't mean your business needs to slows down. Fall is a great opportunity to schedule more work and upsell new products or services with winterization promotions. Traditionally, winterizing is seen as a great way to make additional money at the end of the year. Most professionals focus on signing up customers, scheduling routes, completing the job and moving on; however, winterization offers a huge opportunity to upsell and pre-book jobs for your team during the winter, when work is less readily available. Choose a service or product to promote. Use sales tools to promote your offer during customer interactions. Complete the work, reap the rewards. Step 1: Choose a service or product to promote. To make more money from every winterization job, create a promotion that focuses on a single compelling offer or discount. Make sure you promote the winterization offer at three natural customer interactions: during scheduling, on the job and at payment collection. Mark Stuhlsatz of leading irrigation company, Ryan Lawn and Tree in Kansas City, experienced firsthand how effective winterization promotions can boost revenue during the slow season. “Our Winter Rachio Promotion generated over $30,000 in additional revenue during January and February that wouldn't have happened otherwise due to our cold winters,” said Stuhlsatz. 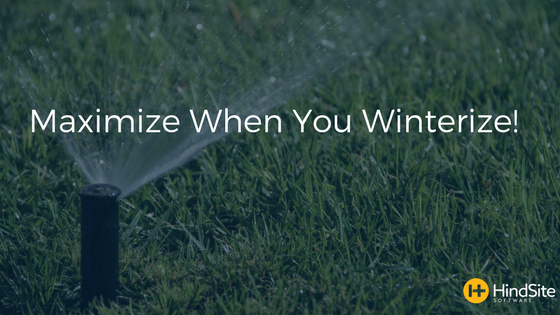 Winterize and receive $100 off a Rachio Smart Sprinkler Controller. Schedule your spring activation now and save $30. Sign up for our annual maintenance plan and save $50. Step 2: Use sales tools to promote your offer during customer interactions. To schedule the job (email or phone). While the work is performed (in-person). To complete payment (email or phone). With little additional effort, you can use each of these interactions to mention the winterization promotion you selected in Step 1. Sales tools like email templates and phone scripts are a great way to introduce your promotion during job scheduling. When you are on the job, a flyer can help promote your offer or remind the homeowner to schedule service at a later time. Finally, there is one last chance to upsell by including your promotion on the invoice. Promote during scheduling with an email or phone call. Contact existing customers to schedule winterization services and advertise your additional promotion. Create an email or phone script that encourages customers to schedule, then provides an opportunity to add on additional products or promotions. View a sample email or phone script. Hand out a flyer on the jobsite. Have a conversation onsite explaining the promotion or service you’re offering. Give the homeowner a chance to sign up on the spot, and hand out a flyer or other collateral as a leave-behind reminder. View a sample flyer. Add your service or promotion to an invoice. Add the promotion to your winterizing invoice to give homeowners one last chance to sign up. Make a new product in your accounting system to quickly add services or promotions to each invoice. View a sample invoice. Visit rachio.com/pro/winterization to access these tools or learn more! Step 3: Complete the work, reap the rewards. If your winterization promotion was a discount and/or installation on a physical product, you can now schedule and invoice additional business for the next few months. If your promotion sold a discount on a contract or service, then you have great head start on the new year and can begin planning and scheduling new service. Either way, congratulations you’ve unlocked the value of winterization promotions! By leveraging each customer interaction with sales tools during when scheduling, on the job and during invoicing, your customers will be increasingly more likely to take you up on the offer each time they see it. For examples or to download sales tools to support your winterization promotion, visit rachio.com/pro/winterization. If you have questions or would like to run a customized winterization promotion for the Rachio Smart Sprinkler Controller, please reach out to pro@rachio.com.